One of the many unwelcome side-effects of global warming is the unpredictable weather patterns that it causes. In Brazil, those same patterns could be the start of a severe disruption to the country’s agriculture sector. At stake is a $250 billion farm industry, food for millions of poor and supplies to world markets of Brazil’s major export crops such as soybeans and coffee. We can’t change our planting calendar or the rains. How can I minimize my risks? We hope science will provide some answers. Protecting harvests requires that farmers have the tools necessary to cope with changing weather and market variations. 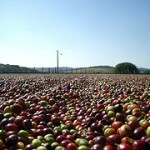 Brazil’s government has begun working with new coffee strains which resist heat (by having longer roots) to deal with the potential changes to the country’s agricultural model. Agronomic research should aim to focus on these issues of water use, soil fertility, post-harvest losses, climate change, and alternative uses for by-products. The impact of this will be felt globally, as Brazil is the leading exporter of coffee, beef, soybeans, orange juice, and other farm products.